September | 2008 | okay, peanut. sweet, fog & ripped off! Sea-Bands rock nausea’s socks off! Yeah, take that, nausea. On a whim, I decided to scour the CVS shelves at lunch today to see what anti-nausea products I could find. As my death cold got downgraded to a cold this morning, my nausea kicked it up a notch (or two, or three …) to constant and disturbing. What I found were Sea-Bands, which came in at nearly $10. At this point, desperate beyond belief, I was ready to try anything. What the heck. My friends, the 10.5 hours that’ve followed have been sheer bliss! While I’m not 100%, I’ve gone from about 50% me to around 75-80%. I can so live with that! I’m singing in the car again! I’m laughing to myself again! And I am once again being kind, happy and bubbly! This is the real me! Now they look like wrist sweatbands – like I belong at the gym, going full force on the treadmill. I don’t care! I wear Sea-Bands and I wear them proudly! Yes! P.S. – The ultimate success came when I logged on to write this crazy post and checked my e-mail. I had posted about the Sea-Bands on a pregnancy discussion board, and got an e-mail that someone posted a reply. I couldn’t be happier to read that someone tried them because of my post and loves them as much as I do! It’s so funny; when I first read it, I thought it was me – her writing style is exactly like mine (Scary, I know!)! I thought it was my post! Yay – I helped another nausea victim! I love it! You’re so welcome! So Tuesday is class night. I got out of class about an hour early – yippee! It was raining earlier, but once I left the building, all that’s left was some serious fog. I climbed into my car and remembered … I now have fog lights! Yes! I used them for a good bit of the drive home, and it was so sweet! Okay, so on my way home, I remembered that there’s a Wendy’s on the way. Oh no! Given that I had cereal for dinner, and this is my first day of feeling good again, it’s okay. I went through the drive-thru and ordered a chicken nugget kid’s meal. Yum! All’s well; I’m given the correct order and everything is great. As I near the end of my meal, however, I realize that I’ve been ripped off. Where’s my toy? I’m not sad for myself (Although I WOULD have liked to at least try it out! ), but for my nephews. I’m sad because the toys at Wendy’s ROCK right now. Hello, people … they’re Hasbro throw-back games! We’re talkin’ Barrel of Monkeys, Battleship, Chutes & Ladders, Candy Land, and Cootie! (I have to admit; I might have had to keep Cootie for myself. Sorry, boys!) No, you should NOT be ordering your value meals. It’s so worth a kid’s meal, my friends! Now I know that I have no child in the car, although I doubt they could tell because my windows are tinted. Here’s what they must have been thinking, “Lady, we know you’re not feeding a child, but the child in your stomach, so we’re not giving your unborn child a toy.” Kiss my grits. As I approach home, the thought occurred to me … maybe I ate it! This is the first time in almost 2 weeks that I’ve actually felt like eating. What if, in my overly ambitious frenzy to get good tasting food down my throat, I ate the daggone toy?! Between the bands, fog and mayhem at Wendy’s, I’m not sure about some of the details of tonight! Everything’s a little … foggy! Aah ha ha! So the death cold/flu has been downgraded to a normal cold today – yay! Thank heavens. I no longer ache and finally feel like I can somewhat function without collapsing. I still sound like a big nose and am complete with sniffles, sneezes and coughs, but I can handle that. I also managed to pull a nice, long muscle in my back (Coughing, I suspect. ), but it’s okay with me. Note: this paragraph could be considered graphic and disgusting. Please read at your own risk. Last night as I was making dinner and chatting on the phone with my husband, I got the sudden urge to vomit. Determined to try, I hung up with him (“Love, I’m going to go try to vomit. I’ll call you back, okay?”), went into the bathroom and faced my friend, the toilet. After about half a dozen unsuccessful attempts, I walked away defeated. Toilet: 6, me: 0. I don’t know how people do it – make themselves throw up, that is. I wish I could. I’m tempted now, but (1) I’m at work, and (2) I know it won’t happen. It’s all I want to do, and all I can think about. I’m so close, just not close enough. Argh. I’m back to taking my big girl vitamins. Now that I feel human again, I can convince my inner-self that they’re okay and move on from the Flintstones. Don’t worry, though, those Flintstones are still a crutch! Upon checking my e-mail this morning, I discovered a “Save the Date” e-mail from a good high school friend – yay! She’ll be getting married in January of ’09, and I couldn’t be happier for her. After a really rough year, she deserves every happiness the world holds for her. So as I’m writing the date in my planner, I realized … I’ll be 6 months pregnant by the end of January! Holy crud! Hold on; calculation needed. On her wedding day, I’ll be <calculating> 25 weeks! By that time, the bubble will be around 13.5 inches long and weigh 1.5 lbs.! My, oh my! I’m very much looking forward to Friday, when I’m treated to a manicure and pedicure at the lovely Robert Andrew Salon & Spa. I’m blessed to work for a company that treats their female employees so well; yes, work is sending us to the spa! This is, I believe, the third year in a row for this, and I love it just as much every year! Of course, I’ll be sans the massage this time around because of the bubble (I’m not far enough along for a maternity massage. ), but it’s okay. It will still be wonderful! … with one more week until we meet the bubble! Note: I’m switching the What to Expect post to the matching week, as well. It’s just too confusing, and I’m 7 weeks even if they want to call it 8, so I’m posting 7 weeks. Instead of changing all previous posts, this week will just be a repeat. This past week was seriously rough. On top of feeling ridiculously nauseous at times, I got what I’d like to refer to as the death cold/flu. Nauseous, tired, weak, aching like crazy, always cold, sore throat, yucky nose, can’t hear, and headache. I spent all weekend on the couch, with my biggest accomplishments being a shower each day and two whole loads of laundry! Sounds like a real party to me! I’ve made the decision to subject myself to the flu shot this year. I’ve always been against it, and told myself I wouldn’t even get it this year, despite the fact that I’m carrying around a bubble. Well, after this weekend, I don’t think I can afford NOT to. This is a huge decision for me; one that I can’t believe I’ve made! Now all I have to do is follow through. Ugh. My diet has consisted of extremely exotic foods: mini bagels, oyster crackers, plain elbow noodles, rice and chicken nuggets. (Yeah, the exotic was just a joke. Can we get any more bland?) For a little excitement, I’ve thrown in peppermints and Jolly Ranchers. I’ve been losing around 1 lb./day – woohoo. Oh, and I’ve made the switch to Flintstones for now. While I’m almost certain it’s not my prenatals making me sick, I just can’t bring myself to take them until I feel a little bit better. I’ll resume them when this phase settles down a bit. Let’s hope for a better week this week and a speedy recovery from the death cold/flu; I really don’t like this! P.S. – Don’t forget to enter your guess on the bubble’s vitals! The big news this week: Hands and feet are emerging from developing arms and legs — although they look more like paddles at this point than the tiny, pudgy extremities you’re daydreaming about holding and tickling. Technically, your baby is still considered an embryo and has something of a small tail, which is an extension of her tailbone. The tail will disappear within a few weeks, but that’s the only thing getting smaller. Your baby has doubled in size since last week and now measures half an inch long, about the size of a blueberry. If you could see inside your womb, you’d spot eyelid folds partially covering her peepers, which already have some color, as well as the tip of her nose and tiny veins beneath parchment-thin skin. Both hemispheres of your baby’s brain are growing, and her liver is churning out red blood cells until her bone marrow forms and takes over this role. She also has an appendix and a pancreas, which will eventually produce the hormone insulin to aid in digestion. A loop in your baby’s growing intestines is bulging into her umbilical cord, which now has distinct blood vessels to carry oxygen and nutrients to and from her tiny body. Your baby, having doubled in size since last week, is as big as a blueberry (about 1/2 inch in length). How does your baby grow? Pretty fast, actually. 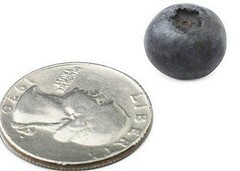 At seven weeks pregnant, your baby’s length is approximately a quarter of an inch — the size of a blueberry. Sounds pretty tiny still? Consider this for a little perspective: Your baby is 10,000 times bigger now than it was at conception a month ago. The biggest fetal growth this week is your baby’s head (the better to store all those smarts in), with new brain cells being generated at the rate of 100 cells per minute. How’s that for a budding genius? And talking about buds, your baby is going out on a limb this week as his or her arm and leg buds begin to sprout and grow longer (and stronger), dividing into hand, arm, and shoulder segments — and leg, knee, and foot segments (though the limb buds look more like paddles than hands or feet at this early stage). Also forming this week are your baby’s mouth and tongue. And although your embryo is just one month old, it’s already gone through three sets of kidneys. The ones in place now are the permanent set and are poised to begin their important work of waste management. In about a week, your baby will start producing urine. Lucky for you, there’s no need for diapers (yet). As your baby matures inside you, much of that urine will be excreted into the amniotic fluid, swallowed again by your baby, and then excreted again in a continuous cycle. i’ll be keeping my teeth, thank you. I realized something last night as I was brushing my teeth before bed. It’s amazing that pregnant women and moms everywhere have any teeth, particularly those hanging out in the back. Let me explain. It now takes me a good 5-7 minutes to brush my teeth. No, my brush isn’t in there for that long, and of course my teeth aren’t green and requiring extra help. I spend 5 minutes or so talking it up, convincing myself that it will be okay. Once the brush makes its way in there, I brush those suckers as quickly as I can. If too much “stuff” is hanging out in there for too long, I’ll be sick. And heaven forbid I hit any of the 4 back teeth or anything even remotely connected to my throat. The result – instant “upchuck” reflex. Brushing my teeth has become one of the most challenging and unpleasant chores of my day. So, if this happens to pregnant women all the time, tell me … how do we manage to keep our teeth? I’m trying my best, but there are times that the back four just don’t get a lot of love. I’m sorry, guys. I promise you some serious TLC once this phase is over. So I’ve decided to have some fun and set up an online baby pool. Enter your guesses about the bubble’s gender, weight, length, and arrival time! There are also a few polls. Go here, people, and have fun entering your guesses! Yippee! P.S. – You can change your guesses, so don’t be afraid to enter it now and change it later! so big … or little! 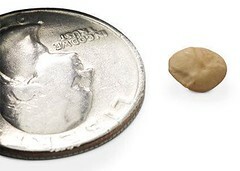 Having a hard time imagining the bubble the size of a lentil? 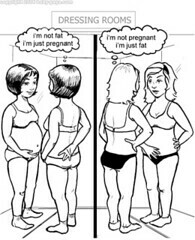 This cool series of images is brought to us by BabyCenter, and shows us in imaginable terms. Presenting … our bubble at 6 weeks! P.S. – There was no nap when I got home. Instead, I watched Babies: Special Delivery. Every time a baby was born and the parents met him/her for the first time, I cried. All I could think is, “That will be us in less than 8 months! A little person!” Get a grip, Min! It made me, at least momentarily, not loathe being pregnant so much. Don’t worry; I’m right back to my normal first trimester-hating self today! P.S.S. – I did not make it to Grey’s Anatomy last night, so I’ll be watching it online. In fact, I didn’t make it past 7:30! Ha! Today’s going to be a long day. While I don’t feel terribly nauseous yet, I seem to have developed a cold, so my sinuses, throat and aching head are putting themselves front and center this morning. What an awesome combination! I love it! Saturday – 8 … tired, but feelin’ pretty good. Sunday – 7 … sick from time to time and tired, but generally okay. Car rides = no fun. Monday – 5 … moderately nauseous all the time. Tuesday – 5 … moderately nauseous all the time. Today (so far) – 6.5 or 7 … mildly nauseous constantly and a bit more from time to time, but I can handle this! I’ve determined my threshold. I can handle, on a fairly continuous basis, a level 5, and maybe even a few 4s. If I have many more days like yesterday, I will be calling to see if there’s anything I can take. For today, I’m rockin’ feeling okay! I did some praying before bed, and asked my husband to do the same; seems it worked! I’m cool with the tiredness, although I really haven’t been tired since Sunday. No naps necessary this week – yay! I go to bed around 9 and I’m cool the next day. Of course, after yesterday, I’ll take anything but that. It’s been a long time since I’ve felt that bad, and I don’t wish that on anyone. Note – I will be napping today; the Grey’s Anatomy 2 hour season premiere starts tonight at 9:00! An 11:00 bedtime will be rough!